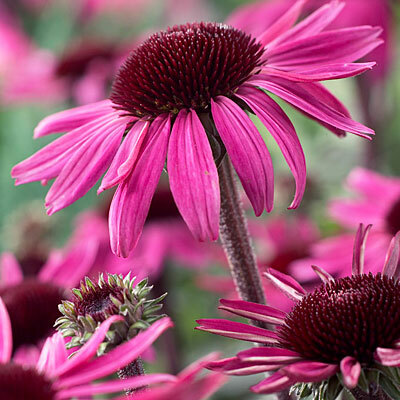 This lovely variety of the popular coneflower has large pink-to-purple daisy flowers and is a favorite in all wildflower meadows, as well as perennial borders. This pretty plant is called Echinacea After Midnight. growing echinacea and how to collect seed and propagate it herePurple coneflowers are native to South Eastern USA. They are a popular cottage garden plant that is robust and very hardy. See my general tips for . How to grow Echinacea After Midnight. Temperatures: Very heat tolerant. Like most cone flowers, needs little care after the first year. Watering: Water well to get it established after planting and then it is drought tolerant too. Dead heading: Not necessary. The birds like the seeds in the winter! Spacing: 8 to 14 inches. It will grow to about 18 inches tall. Blooms: Early summer to fall. Love the deep colour of this variety. I’ll be checking to see if it’s available in Canada.